ESB Networks has said that around 6,000 customers are without power as a result of Storm Eva. The worst affected areas are Fermoy in Co Cork and Kilcoole in Co Wicklow. High winds and heavy rain are battering the west and northwest, as Storm Eva moves across the country. Met Éireann said while there will be severe conditions for a time, the storm is likely to clear relatively quickly. A Status Orange wind warning is in place for Donegal, Galway, Mayo, Sligo and Clare with gusts of up to 120km an hour expected. The warning is valid until midnight tonight. 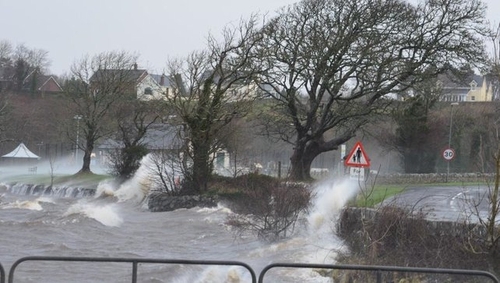 Earlier, Clare County Council issued a storm warning for the entire county - urging land, home and business owners, particularly in low lying coastal areas, to take precautionary steps. It is due to a heightened flood risk as a result of a combination of strong winds, sea swell and high tides. Limerick City Council installed flood defences and has urged the public to be cautious near the waterways over the Christmas period, with heavy rain and higher than average tides expected. Elsewhere, a Status Yellow wind warning is in place for Leinster, as well as counties Cavan, Monaghan, Leitrim, Roscommon, Cork, Kerry, Limerick, Tipperary and Waterford. Speaking on RTÉ's Morning Ireland, Met Éireann's Gerald Fleming said gusts will be very strong for a short time in the west and northwest of the country. Once the storm passes, Mr Fleming said Christmas Eve and Christmas Day will be relatively calm days with the possibility of some wintry showers. "We expect actually after the storm passes tonight to have a fairly chilly day tomorrow which is unusual because it has been so mild," he said. "Nothing particularly cold, but we will have a few wintry showers here and there and it will feel a little bit nippy, you'll want to wrap up well if you're going out. "But it seems like the night of the 24th into the 25th will be quite a calm clear night." Looking ahead into next week, more heavy rain will return, which Mr Fleming added, could bring more problems in terms of flooding. Bernadine Moloney, Head of Communications with the ESB, said ESB crews are on standby and she urged people who experience power outages to go to powercheck.ie, or to contact its helpline on 1850 372 999. Speaking on RTÉ's Drivetime Ms Moloney said 800 households are currently without power due to one cable fault in Fermoy.